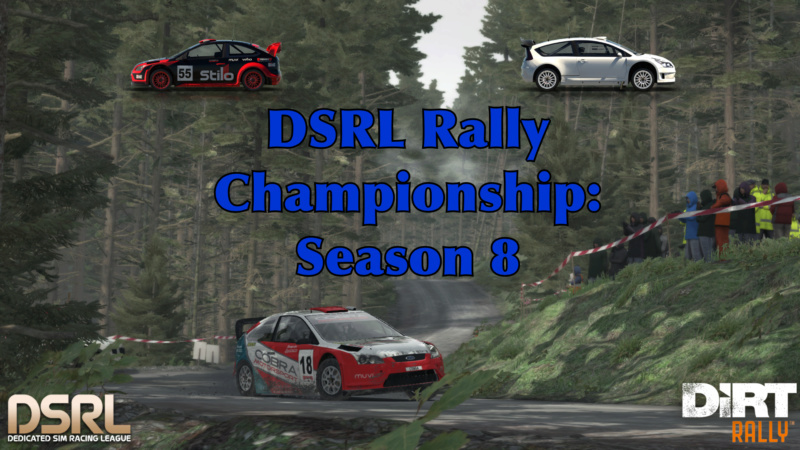 Welcome all XB1 DiRT Rally players to Season 8 of the DSRL Rally Championship! The season will begin on October 11th and will consist of six rounds, each lasting one week. Each rally in season 8 will include 8 stages and 3 service areas for checkpoints, car repairs, and tuning. This season we will be driving the two faster cars from the 2000's class that weren't previously part of season 6. The 2007 Ford Focus and the 2010 Citroen C4. The teams championship is optional to all season 8 drivers. Teams must consist of 2 already registered drivers, both drivers must be in the same car to be eligible for a team entry. The most combined points from the 2 drivers of each team at all events will determine the season 8 team champions. Don't hesitate to ask other drivers registered in the same car as you if they would like to be on a team! No show/DNS for 3 consecutive rounds without prior notification to admin: -7pts & gamertag noted on poor participation list. No show/DNS for 4 consecutive rounds without prior notification to admin: Immediate championship expulsion & banned from registering for the next DSRL RC season, gamertag recorded on DSRL RC driver probation list. *Once the season begins (your first stage completed of round 1), registered car or team choice cannot be changed. You must use the same car/ be in the same team for all events this season. 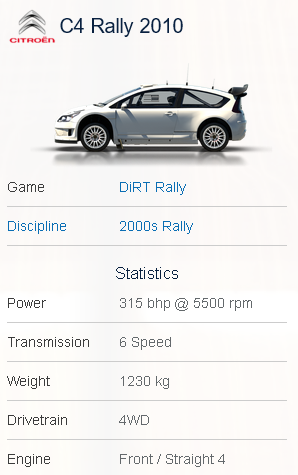 Car/team can still be changed up until the point the first stage of the first rally is completed by the entered driver. *We expect all sign ups to participate in all scheduled rallies as they are each going to be open for entry for a week. If you know you are going to miss a scheduled event we would ask that you message a DSRL admin/organizer and let them know before to ensure you are not penalized for it. IF YOU THINK YOU ARE LIKELY TO MISS MORE THAN 3 ROUNDS OF THE 6 ROUND CHAMPIONSHIP, PLEASE DO NOT SIGN UP. 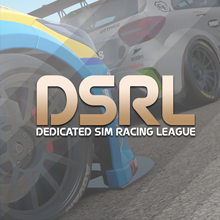 *Existing DSRL RC Racenet league members from the previous season must re register on the forum for the current season in order for any rally times/ points to be counted. If you find yourself removed from the racenet league, make sure you are properly registered for the active season and submit a new request to join once you have done so. *Racenet may show a 7th championship round at Pikes Peak, you do not need to submit a time for this. It is merely to add a cool down period and allow admin to collate the season's info. *Points shown on the racenet site and in game are not shown correctly, please check here on the DSRL forum for the official championship standings once the season is underway. *Number of signups is unlimited and registration will remain open to new entries throughout the entire season. If you withdraw your entry mid season, you will be marked N/A in the standings from that point on. *As there is no way of the league hosts directly controlling settings such as assists, interior views, HUD etc. these will all be down to player personal preference. It is recommended to turn off all assists for optimum car performance however. *This championship will be hosted and organized through Codemaster's Racenet, so an account is required to enter. The sign up for This account should have been created when you first played the game and it can be easily accessed through the Xbox online browser under the "leagues" tab at the main menu. It is advised you become familiar with navigating the site and leagues area in game if you haven't looked at it already. IMPORTANT: When you have posted your registration, Search for "THE DSRL RC" on racenet or follow this link here https://www.dirtgame.com/uk/leagues/league/66869/the-dsrl-rc and submit a request to join the league if your are not in it already. your request to join will be accepted once registration is confirmed. Team mate required at N-Sport in the Citroen C4. Driver must be sure he can complete the full season. Driver doesnt` have to be fast (but it helps) just needs get involved and have fun. I`ve been at Wales Rally GB since Wednesday giving some drivers a few tips and enjoying some Hyundai hospitality so I`m really fired up about Season 8. @Sloe wrote: Team mate required at N-Sport in the Citroen C4. I like your enthusiasm, you can be N-Sports number 2 driver in the C4. 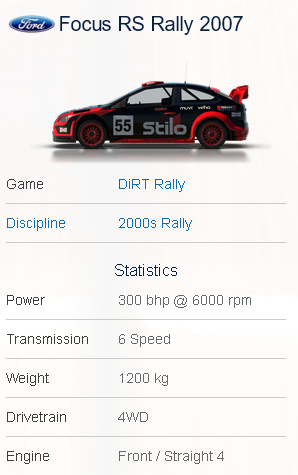 Welcome to the DSRL guys, great to have you on board for the rallying! Anyone want to team up with me in the Citroen for this season? @EpilepticToast wrote: Welcome to the DSRL guys, great to have you on board for the rallying! Thanks. We're excited to be competing. Both of us recently rediscovered our love for the game and need some league racing to scratch the itch. Conspiracy tends to be the one with the better pace but has difficulty keeping the tire inflated. I'm a bit more conservative but usually bring the car home in one piece. Hey I know I'm down to the wire here but can I still join? I usually can't do these because of my insane work hours but winter is kicking in and the workdays won't be so brutal. I'll thrown it in but just let me know if it is too late. Thanks. @AKWOMBOLOGY wrote: Hey I know I'm down to the wire here but can I still join? I usually can't do these because of my insane work hours but winter is kicking in and the workdays won't be so brutal. I'll thrown it in but just let me know if it is too late. Thanks. Submitting entries for previous season returnees RCRallymanVW & HazardousMike who are experiencing site login issues.